This species is accepted, and its native range is Tropical & Subtropical America. It is used to treat unspecified medicinal disorders. 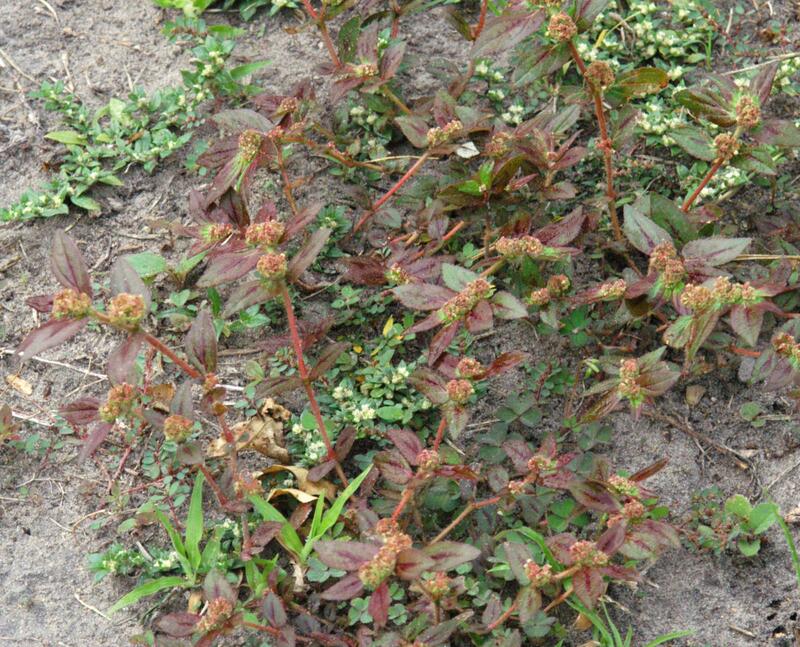 Annual herb, prostrate to ascending, with branches to 50 cm. long, the whole plant pilose, including the inflorescence and capsule, with minute white adpressed hairs interspersed by yellow spreading segmented hairs ± 1.5 mm. long principally on the branches and especially on younger growth. 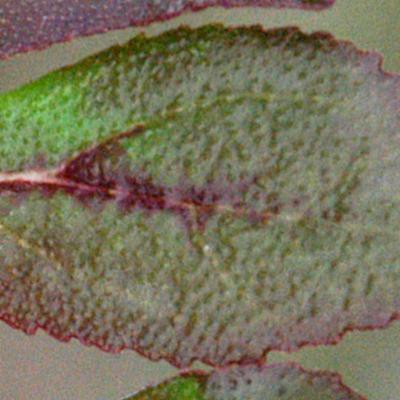 Leaves ovate, 1–4 × 0.5–2 cm., base very obliquely rounded, apex subacute, margin finely toothed, upper surface sometimes almost glabrous, often blotched with purple especially in the region of the midrib; petiole to 3.5 mm. long; stipules linear, rarely laciniate on lush specimens, to 2.5 mm. long. Cyathia in dense capitate, terminal and axillary cymes to 15 mm. in diameter on peduncles to 15(–20) mm. long, occasionally subtended by 1–2 small leafy bracts ± 1 cm. long; cyathial peduncles to 1 mm. long; bracts deltoid, deeply laciniate to 1 mm. long. Cyathia ± 0.8 × 0.8 mm. with cup-shaped involucres, usually tinged with purple; glands 4, minute, elliptical, green or purplish, with minute entire white to pink appendages; lobes triangular, fimbriate. Male flowers:bracteoles linear, fimbriate; stamens 1 mm. long. Female flower:ovary shortly pedicellate; styles 0.4 mm. long, spreading, bifid almost to the base, with thickened apices. Male flowers:bracteoles linear, fimbriate; stamens 1 mm. long. 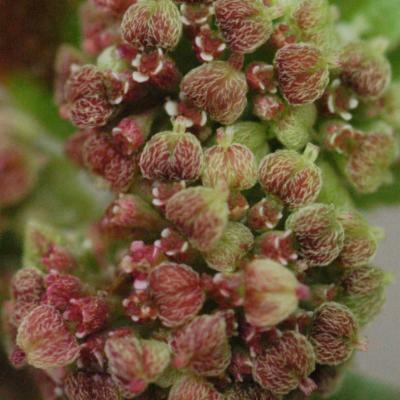 Female flower:ovary shortly pedicellate; styles 0.4 mm. long, spreading, bifid almost to the base, with thickened apices. Capsule just exserted on a pedicel 1 mm. long, acutely 3-lobed, with truncate base, 1 × 1.25 mm., pilose with short yellow adpressed hairs. Seeds oblong-conical, 0.8 × 0.4 mm., pinkish brown, with slight transverse wrinkles. Cultivated land, roadsides and waste places; 0–2000 m.
Nativa en Colombia; Alt. 0 - 2800 m.; Andes, Islas Caribeñas, Llanura del Caribe, Orinoquia, Pacífico. 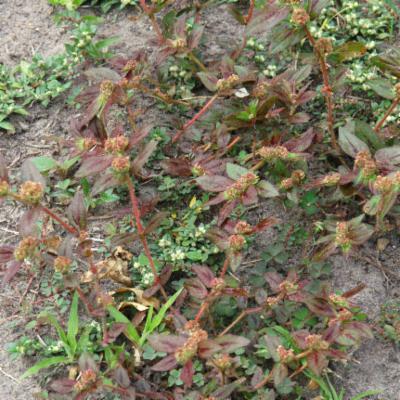 Annual herb, prostrate to ascending, with branches to 50 cm long; whole plant pilose, including inflorescence and capsules, with minute white appressed hairs interspersed by yellow spreading segmented hairs c. 1.5 mm long principally on the branches and especially on younger growth. Leaves with a petiole to 3.5 mm long; stipules to 2.5 mm long, linear, rarely laciniate on lush specimens; lamina 1–4 × 0.5–2 cm, ovate, apex subacute, base very obliquely rounded, margin finely toothed, upper surface sometimes almost glabrous, often blotched with purple especially in the region of the midrib. Cymes terminal and axillary, densely capitate to 15 mm diameter on peduncles to 15(20) mm long, occasionally subtended by 1–2 leaf-like bracts c. 1 cm long; cyathial peduncles to 1 mm long. 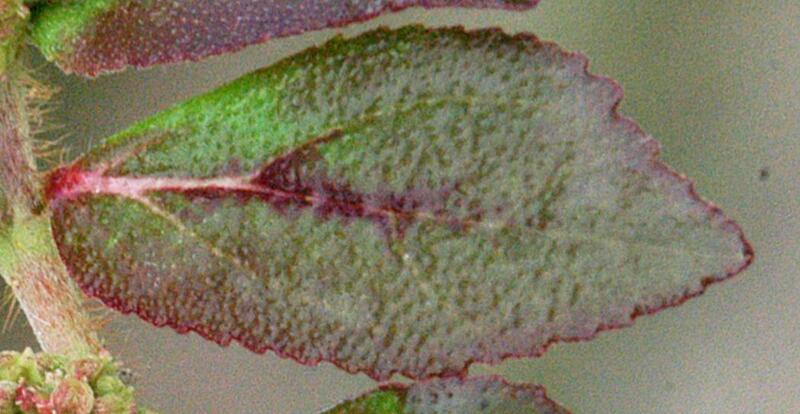 Bracts to 1 mm long, deltoid, deeply laciniate. 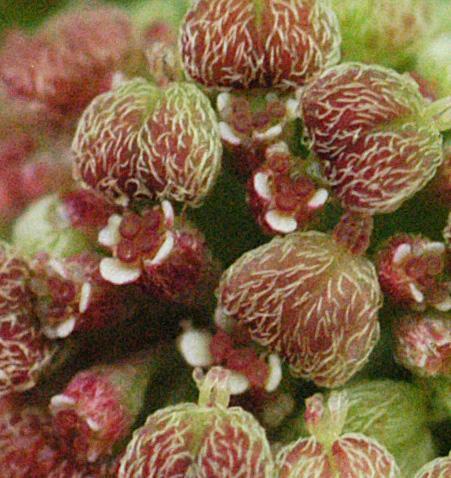 Cyathia c. 0.8 × 0.8 mm, with cup-shaped involucres, usually tinged purple; glands 4, minute, elliptical, green or purplish, with minute entire white to pink appendages; lobes triangular, fimbriate. Male flowers: bracteoles linear, fimbriate; stamens 1 mm long. Female flower: ovary shortly pedicellate; styles 0.4 mm long, spreading, bifid almost to the base, with thickened apices. Male flowers: bracteoles linear, fimbriate; stamens 1 mm long. Female flower: ovary shortly pedicellate; styles 0.4 mm long, spreading, bifid almost to the base, with thickened apices. Capsule just exserted on a pedicel 1 mm long, 1 × 1.25 mm, acutely 3-lobed with truncate base, pilose with short yellow appressed hairs. Seeds 0.8 × 0.4 mm, oblong-conical with obscure transverse wrinkles, pinkish-brown. Alt. 0 - 2800 m.
Medicinal (State of the World's Plants 2016, Instituto Humboldt 2014). Alabama, Argentina Northeast, Argentina Northwest, Arizona, Aruba, Bahamas, Belize, Bolivia, Brazil North, Brazil Northeast, Brazil Southeast, Brazil West-Central, California, Central American Pac, Chile Central, Colombia, Costa Rica, Cuba, Dominican Republic, Ecuador, El Salvador, Florida, French Guiana, Georgia, Guatemala, Haiti, Honduras, Jamaica, Leeward Is., Louisiana, Mexico Central, Mexico Gulf, Mexico Northeast, Mexico Northwest, Mexico Southeast, Mexico Southwest, Mississippi, Netherlands Antilles, Nevada, New Mexico, Nicaragua, North Carolina, Panamá, Paraguay, Peru, Puerto Rico, South Carolina, Southwest Caribbean, Texas, Trinidad-Tobago, Turks-Caicos Is., Utah, Venezuela, Venezuelan Antilles, Windward Is. Euphorbia pilulifera var. discolor Engelm. Euphorbia pilulifera var. glabrescens Thell. Euphorbia pilulifera var. guaranitica Chodat & Hassl. Euphorbia pilulifera var. hirta (L.) Thell. Euphorbia pilulifera var. obliterata (Jacq.) Hitchc. Tripa de pollo, atu rui, yerba de pollo. Dimopoulos, P. & al. (2016). Vascular plants of Greece: An annotated checklist. Supplement Willdenowia 46: 301-347.
de Moura Júnior, E.G. & al. (2015). Updated checklist of aquatic macrophytes from Northern Brazil Acta Amazonica 45: 111-132. Hand, R. (ed.) (2015). Supplementary notes to the flora of Cyprus VIII Willdenowia 45: 245-259. Shaheen, H., Qureshi, R., Akram, A., Gulfraz, M. & Potter, D. (2014). A preliminary floristic checklist of Thal desert Punjab, Pakistan Pakistan Journal of Botany 46: 13-18. Velayos, M., Barberá, P., Cabezas, F.J., de la Estrella, M., Fero, M. & Aedo, C. (2014). Checklist of the vascular plants of Annobón (Equatorial Guinea) Phytotaxa 171: 1-78.
da Silva, O.L.M., Cordeiro, I. & Caruzo, M.B.R. (2014). 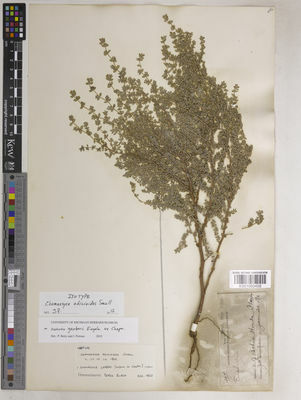 Synopsis of Euphorbia (Euphorbiaceae) in the state of São Paulo, Brazil Phytotaxa 181: 193-215. Halford, D.A. & Harris, W.K. (2012). 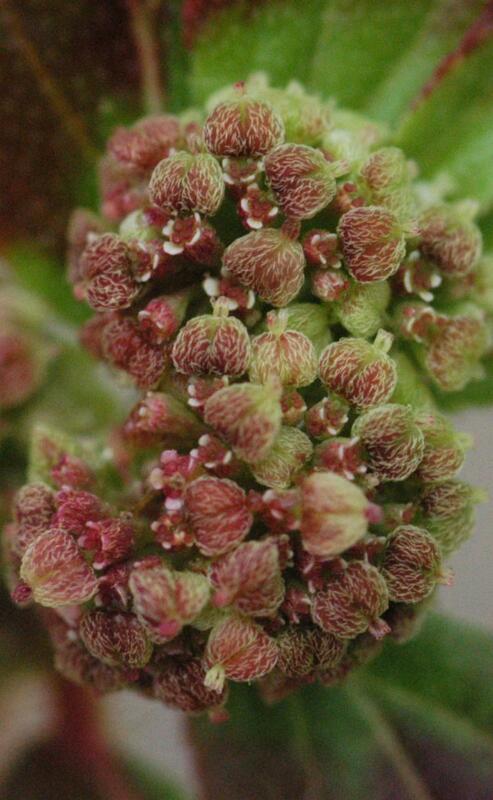 A taxonomic revision of Euphorbia section Anisophyllum Roeper (Euphorbiaceae) in Australia Austrobaileya 8: 441-600. Bhellum, B.L. (2012). Flora exotica of Jammu and Kashmir (List- I) Journal of Economic and Taxonomic Botany 36: 33-45. Yang, Y., Riina, R., Morawetz, J.J., Haevermans, T., Aubriot, X. & Berry, P.E. (2012). Molecular phylogenetics and classification of Euphorbia subgenus Chamaesyce (Euphorbiaceae) Taxon 61: 764-789. Fischer, E., Rembold, K., Althof, A. & Obholzer, J. (2010). Annotated checklist of the vascular plants of Kakamega forest, Western province, Kenya Journal of East African Natural History 99: 129-226. Binojkumar, M.S. & Balakrishnan, N.P. (2010). 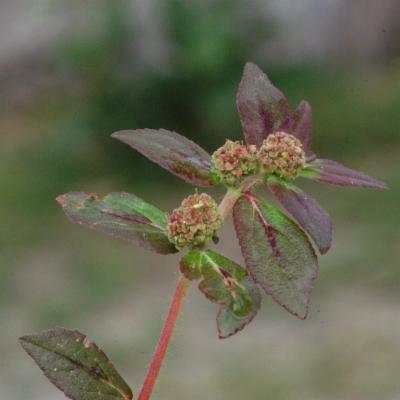 The genus Euphorbia L. (Euphorbiaceae) in India. A taxonomic revision: 1-430. Bishen Singh Mahendra Pal Singh, Dehra Dun. Catarino, L., Sampaio Martins, E., Pinto-Basto, M.F. & Diniz, M.A. (2006). 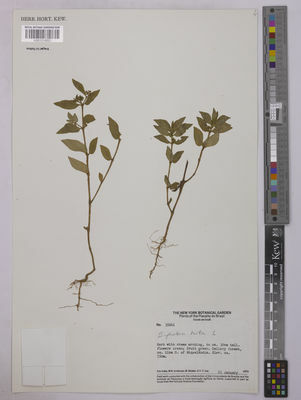 Plantas Vasculares e Briófitos da Guiné-Bissau: 1-298. Instituto de investigação científica tropical, Instituto Português de apoio ao desenvolvimento. Sheppard, C.R.C. & Seaward, M.R.D. (eds.) (1999). Ecology of the Chagos archipelago: 1-350. Westbury Academic & Scientific Publishing, Otley. Lebrun, J.-P. (1998). Catalogue des plantes de la Mauritanie et du Sahara Occidental Boissiera 55: 1-322. Thaman, R.R., Fosberg, F.R., Manner, H.I. & Hassall, D.C. (1994). 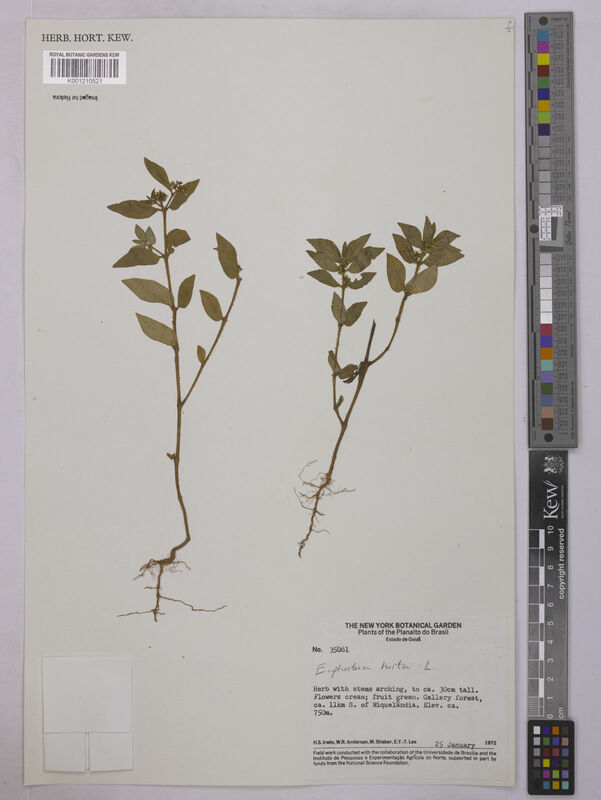 The Flora of Nauru Atoll Research Bulletin 392: 1-223. George, A.S., Orchard, A.E. & Hewson, H.J. (eds.) (1993). Oceanic islands 2 Flora of Australia 50: 1-606. Australian Government Publishing Service, Canberra. Wester, L. (1985). Checklist of the vasular plants of the Northern Line Islands Atoll Research Bulletin 287: 1-38. Parham, B.E.V. (1971). The Vegetation of the Tokelau Islands with special reference to the plants of Nukunonu Atoll New Zealand Journal of Botany 9: 576-609. Sykes, W.R. (1970). Contributions to the flora of Niue Bulletin, New Zealand Department of Scientific and Industrial Research 200: 1-321. Schnell in Ic. Pl. Afr. 1: t. 6. Figueiredo, E., Paiva, J., Stévart, T., Oliveira, F. & Smith, G.F. (2011). Annotated catalogue of the flowering plants of São Tomé and Príncipe Bothalia 41: 41-82. Balakrishnan, N.P. & Chakrabarty, T. (2007). The family Euphorbiaceae in India. A synopsis of its profile, taxonomy and bibliography: 1-500. Bishen Singh Mahendra Pal Singh, Dehra Dun. Takeuchi, W. (2005). Floristic notes from a holocene successional environment in Papuasia Harvard Papers in Botany 10: 95-116. Turner, I.M., Xing, F. & Corlett, R.T. (2000). An annotated check-list of the vascular plants of the South China Sea and its shores The Raffles bulletin of Zoology, Suppl. 8: 23-116. Boulvert, Y. (1977). Catalogue de la Flore de Centrafrique 2(1): 1-85. ORSTOM, Bangui. S. Carter in KB. 39: 643 (1984). A.D.Q. Agnew, Upland Kenya Wild Flowers p. 221 (1974). Hadidi in Bulletin du Jardin Botanique National de Belgique 43: 86 (1973). E. Lind & A. Tallantire, Some Common Flowering Plants of Uganda p. 112 (1962). Cufod., Enumeratio Plantarum Aethiopiae Spermatophyta (Supplement in Bull. Jard. Bot. Brux.) p. 449 (1958). Keay, Flora of West Tropical Africa, ed. 2, 1: 419 (1958). F. W. Andr., The Flowering Plants of the Anglo-Egyptian Sudan2: 71 (1952). R. O. Williams, Useful and Ornamental Plants in Zanzibar and Pemba p. 254 (1949). A.J. Jex-Blake, Some Wild Flowers of Kenya p. 36 (1948). N.E. Br. in Fl. Cap. 5(2): 249 (1915). L., Sp. Pl. : 454 (1753).